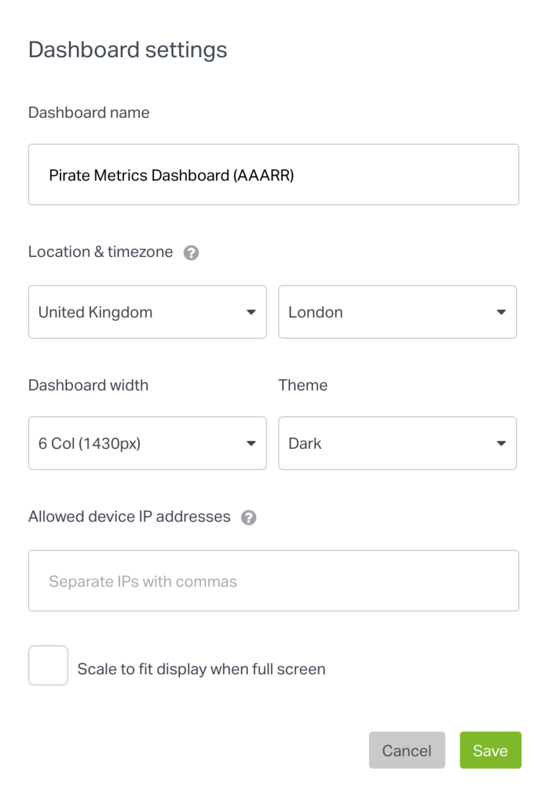 This article is a guide to building the Pirate Metrics (AAARR) dashboard example. Pirate Metrics is a popular metrics framework for online startups created by Geckoboard investor Dave McClure of 500 Startups. The name “Pirate Metrics” comes from the AARRR acronym (say it aloud to yourself and it will all make sense), which stands for Acquisition, Activation, Retention, Referral and Revenue. These summarize the different stages of the customer lifecycle for an online startup. We’ve used this framework to design an example live TV dashboard as inspiration for online startups when building their own dashboards to display in the office. In this article, we'll share the complete steps to build this dashboard from scratch. If you haven't already, you can sign up for a free 30-day Geckoboard trial here. After you're logged into your account, click on the Dashboards menu on the top left. Add a new dashboard by clicking on Add dashboard. Give your dashboard a name. On your newly created dashboard, click on Settings in the header bar and then Dashboard settings. Set the dashboard's ‘Location & Timezone’ to match the timezone set within the services you'll be connecting, that is, to the timezone set within your Google Analytics, Mixpanel, etc. This is required to ensure there's no lag in the data being fetched from these accounts. Set the dashboard width to 6 columns (1430px). If necessary, you can adjust the dashboard width to match your display screen (TV screen) or use the ‘Scale to fit’ option later on. The default settings should be good for the remaining options. Click Save changes. To use our pre-built integrations, you'll first need to create a connection so that Geckoboard can pull in your data. You only need to do this once per integration. Going forward, any new widgets you add will be able to access the connection and pull in data from your connected account (e.g. Google Analytics). If needed, you can also connect multiple accounts for the same service (e.g. multiple Google Analytics accounts). See more details here. As an example, here are the steps to creating a connection with Google Analytics. The process will, more or less, remain similar for other integrations as well. On your dashboard, click on the Add widget button. Now, search for 'Google Analytics' using the search bar on top. Alternatively, you can also scroll down the list of integrations ordered alphabetically till you reach the Google Analytics integration. Click on the integration. Select any one of the widgets available under it. 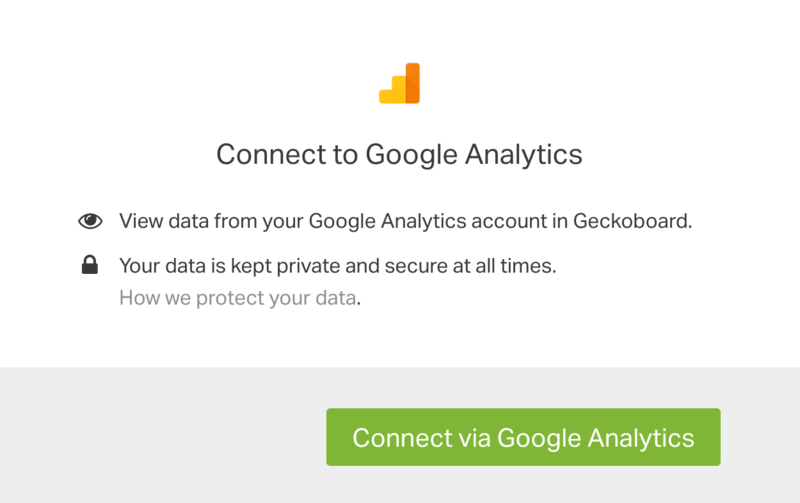 Finally, 'Allow' Geckoboard access to your Google Analytics. It's important to note that the particular configurations and options we're using to create these widgets are only examples to help you get started with your own Pirate Metrics dashboard. You’ll need to tweak and modify your widgets' configurations to better suit your business and KPIs. This widget displays the number of website sessions versus a pre-defined goal. It gives a good indication of how well you’re doing in terms of attracting enough people to your site. We’ll be using the ‘Visitor Number Stats’ widget from our Google Analytics integration to display this metric. Head over to your dashboard, click on Add widget and search for the Google Analytics integration. Click on the integration. Search for and select the 'Visitor Number Stats' widget. When you're happy with all the settings, click Add widget. You’re now tracking your website sessions against your goals on your dashboard! This metric helps you understand if you’re attracting the right people to your site, whether you’ve created an intuitive user journey and if there are opportunities for conversion rate optimization. Head over to your dashboard again. Click on the down arrow next to Add widget and select ‘Google Analytics’ from under ‘Recent Connections’. Search for and select the ‘Goals Number Stats' widget. All done! 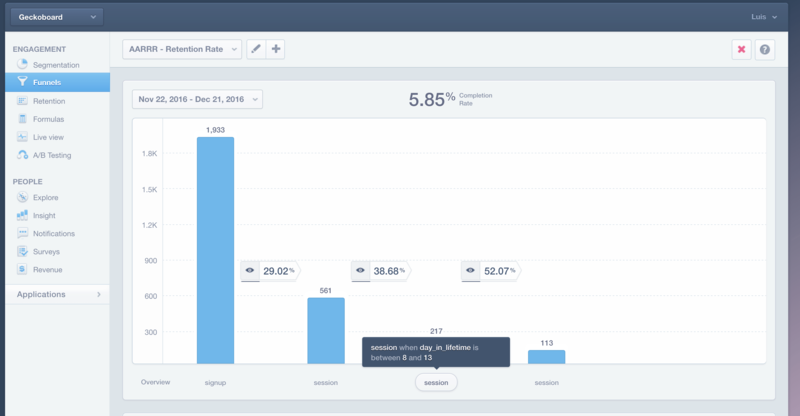 You’re now tracking the signup conversion rate of your website on your dashboard! This widget displays the number of signups this month and how it’s trending. This is helpful in understanding acquisition growth, particularly relative to changes in the previous two metrics we mentioned. We’ll be using the ‘Trends Number’ widget from our Mixpanel integration to display this metric. Head over to your dashboard, click on Add widget and search for the Mixpanel integration. Click on the integration. Search for and select the ‘Trends Number’ widget. You’re now tracking your number of signups on your dashboard! This widget helps you understand what your top performing channels are in terms of acquisition volumes. We’ll be using the ‘Top Sources List’ widget from our Google Analytics integration to display this metric. Search for and select the ‘Top Sources List’ widget. 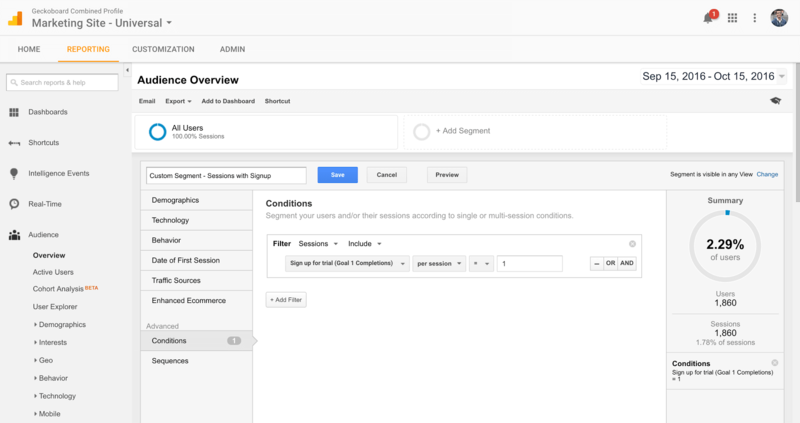 A simple way to filter and include only those sessions which converted to a signup would be to use a custom segment. You can similarly create a custom segment using the required filters within your GA.
You can find out how to create custom segments here. Any custom segments you create within your GA will automatically be available under Geckoboard as well, under the ‘Segment’ field. You’re now tracking your signups by channel! Customer Acquisition Cost (CAC) is the average expense of gaining a single customer. This metric helps you understand how effective each channel is in terms of the cost of acquiring a customer. ($) CAC = ($) Total sales and marketing expenses / (#) new customers acquired. 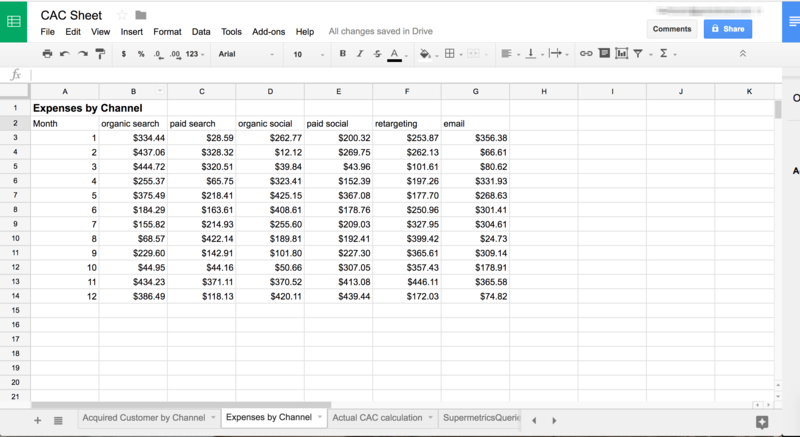 While it may not always be possible to automate the calculations, here’s an effective way to display your CAC by channel. For calculating the CAC, you’ll first need your number of newly acquired customers broken down by month and channel. If you track this data via Google Analytics, you can use tools like Supermetrics or the Google Analytics Spreadsheet Add-on to fetch it into Google Sheets. Both tools are quite powerful and support all of GA’s functionalities such as dimensions, segments, filters, goals, etc., so you can fetch precisely the data you’re after. Supermetrics is easy to use and they provide for manual importing GA data on their free plan. For this widget, you’ll only be calculating your CAC once a month and so the free plan should be sufficient. However, if you’re interested in automated hourly data refreshes and other features, you can check out their paid plans. They offer a 30-day full feature access free trial so you can try things out first. The GA Spreadsheets Add-on is equally powerful, fully free and provides automated hourly importing of data. It requires a deeper understanding of how GA works, though, as compared to using Supermetrics. 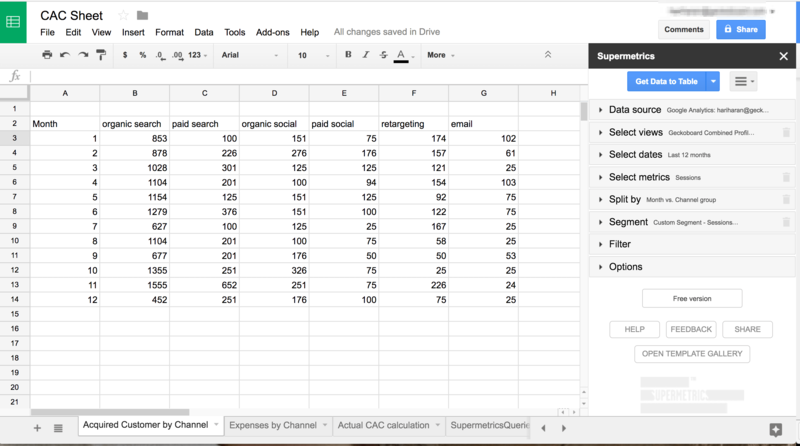 Here’s a screenshot showing our number of newly acquired customers broken down by month and channel fetched into Google Sheets via Supermetrics: If you use a different service (i.e. one besides GA) to track your number of acquired customers or if you need help with using either Supermetrics or the GA add-on, please get in touch with us and we’d love to give you a hand with building this widget. This will be a manual step. You need to calculate the sum of all your marketing and sales expenses (including staff salaries and other overhead expenses) broken down by month and channel matching the format in the previous step. So, go ahead and simply divide the corresponding cells from the previous two steps, and you’ll have your CAC by channel for the last 12 months. Using our Spreadsheets integration, you can now display this data as a line chart on your dashboard. If you need help with using the Spreadsheets integration, check out our guide here. This activation metric helps you understand how well you’re converting prospects from one key activation event to the next. We’ll be using the ‘Funnel’ widget from our Mixpanel integration to display this metric. To build this widget, you’ll first need to add the corresponding funnel in your Mixpanel. For our example, we’ve created a funnel with the following key activation events: User signs up > Adds another user to their account > User subscribes. Now, head over to your Geckoboard dashboard, click on Add widget and search for the Mixpanel integration. Click on the integration. Search for and select the ‘Funnel’ widget. Funnel steps: Select the funnel steps (key activation events) you’re interested in tracking. In our case, as we mentioned before, we’re tracking 'signup', 'added user' and 'subscribe'. You’re now tracking your activation conversion on your dashboard! The retention metric is a useful indicator of how well you’re retaining trialists past a key milestone. In our example, the key milestone is whether the user is continuing to use the app two weeks into their trial. So we’re tracking the two week trial retention rate. We’ll be using the ‘Funnel Completion Rate Line Chart’ widget from our Mixpanel integration to display this metric. As with the previous widget, we’ll first need to add the corresponding funnel in Mixpanel. For our example, we’ve created a funnel with the following events: User signs up > User has at least one session between day 2 - day 7 > User has at least one session between day 8 - day 13 > User has at least one session between day 14 - 21. Head over to your dashboard again. Click on the down arrow next to Add widget and select ‘Mixpanel’ from under ‘Recent Connections’. Search for and select the ‘Funnel Completion Rate Line Chart’ widget. You’re now tracking your customer retention on your dashboard! Net Promoter Score (NPS) is taken from a survey asking customers how likely they are on a scale of 1-10 (with 10 being very likely) to recommend your product or service to others. It’s a great leading indicator of the word-of-mouth referrals you can expect. We’ve visualized this using our pre-built integration with the NPS tool — Delighted. Head over to your dashboard, click on Add widget and search for the ‘Delighted’ integration. Click on the integration. Search for and select the ‘Number Metrics’ widget. You’re now tracking your NPS on your dashboard! Here we visualize the monthly revenue for the past 12 months compared to the previous 12 months. This is a useful lagging metric to highlight the outcomes of the previous leading indicators and, ultimately, visualize topline growth for your online startup. We’ll be using the ‘Revenue Line Chart’ widget from our Mixpanel integration to display this metric. Search for and select the ‘Revenue Line Chart’ widget. Property: The property you use in your Mixpanel to track revenue. In our case, we use a ‘subscribe_plan’ property. Property Value: All. You can show stats for just a particular value (in this case, that would become stats for just a particular plan). Since we’re interested in tracking total revenue, select ‘All’. This widget acts as a header and provides context when viewing your dashboard on a TV screen. Click on Add widget and search for the 'Text' widget. Select it to proceed ahead. Under 'Message one', enter: Pirate Metrics Dashboard Example (AARRR) (or any heading you want to use). Set the size to ‘Full width heading’ and click on 'Add widget'. Now that all the widgets are ready on your dashboard, it's easy to arrange them — just drag and drop them into place! The grid lines that show up when dragging a widget will help you get a pixel perfect alignment. You can also move multiple widgets at a time! Click, drag and select the widgets you want to move as shown in the GIF below. You can then move those widgets around together. Once you're done, click and drag your mouse over an empty space or over a single widget to de-select the widgets. This, too, is shown in the GIF. This feature is especially handy when you want to, say, move the full-width heading widget to the top of the dashboard and then correspondingly adjust the remaining widgets. You can find our recommended approach, devices, and screens for displaying your dashboard(s) on TV screens within your office in our guide here.